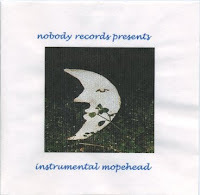 Many times I am at a loss for words (yeah, right Mark)...and for moments like that there is instrumental mopehead. Many of these songs have lyrics written - fully - partly - while others not at all. Some of this music was made for soundtracks, independent movies, video and film. You can find these tracks featured in the NYU grad film "Ozone", the Independent Video "The Anemic Butcher", the web sci-fi saga Super Spy Chick and The SOB Puppet Hour. Jay helped me select the tracks that made the final cut. I have what might amount to a TON of instrumental tracks that have not been released. I should make another pass through them and put out instrumental mopehead volume two...maybe that'd be a good Summer project. 1. sandbag - I envision the Sandman as he travels through the night gently sprinkling sand into our shut and dreaming eyes. Things pick up in the tune mid way through and I don't know what to say about it...in hindsight I probably should have kept it mellow. Somewhere this song has lyrics partly written. 2. If I were - fill in the blank - a song about longing. 3. revolution - This song features a sample of Jay saying "revolution" taken from "The Living Room Sessions". I really dig this track. One of my favorites on the disc. 4. Stanley Rockbottom - A track about not allowing yourself to hit rock bottom - you don't want to be Stanley Rockbottom, do you? This song has lyrics as well, but they've never been recorded. 5. untitled - so...a song named untitled...hmmm...here's what happens - when I start a new song on my E-Mu Darwin the song is called untitled until I title it. This time, I chose not to change it. This song takes me far away each time I hear it. Sometimes I wish I could stay there. 6. girl - This song was written for a man I know who was involved in a long distance relationship with a woman. Each day he would come to work bleary eyed as he spent his nights on the phone with his love. His phone bill was legendary. They are married now with two kids. 7. holloween - This song has some lyrics written for it, but I have yet to complete them which is surprising since it is a song about Halloween. 8. Crushed Black Velvet - I'll never tell what this song is about, but safe to say that I love it when women wear crushed black velvet. 10. better suited for heaven - Sometimes in life you meet people that are just too good to be true. They seem to be better suited for heaven. 11. ...and he's waiting - The feeling of waiting and hoping she will return. Longing. 12. if - It is good to dream...good to ponder..."if". I'll be a little out of pocket for the next few days. I'm going to travel to Tennessee, Alabama and Kentucky. I may blog from the road, but if not I'll be back next week.